Specialized glass cutters suitable for cutting stained glass should always be purchased, cheap cutters available from the local hardware store are not meant for this purpose and will wear out very quickly. Cutters come in a number of styles; the two most common ones are, pencil grip and pistol grip, some have an inbuilt reservoir to hold lubricating oil for the special cutting wheel. If possible you should try the different styles before buying. Glass cutters do not actually cut the glass; they leave a score line when is then separated by using either special pliers or by manually snapping the glass along the score line. There is not much difference between the two styles, pistol grip cutters require less pressure when cutting, and it is a matter of personal preference. If you have to cut a lot of fusing glass then using the normal pencil grip cutter can be quite tiring. Pencil style cutters are held like a pencil or between middle and second finger. Some of these cutters also have small handles, which rest in the palm of your hand and can relieve the pressure on your fingers as well as giving more stability to the cutter. Many people find cutters with handles to be less tiring than the normal pencil grip style. Pistol grip cutters give a lot of control and require less effort to use. As the name implies you wrap your fingers around the handle and commence to score the glass, you are able to apply pressure without undue effort. You need a surface to rest the fusing glass whilst it is being cut. A piece of carpet will work very well. You can purchase special waffle grids for cutting, which allows small pieces of glass to fall into the grid and makes cleaning up easy. Hardware store glass cutting tools available for a few dollars are not suitable, as they will wear out very quickly when used on fusing glass. 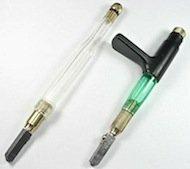 Quality fusing glass cutters will last for a number of years under normal usage. Some have a replaceable cutting head with a carbide steel wheel. Circle cutters usually have a self contained cutter and can be quite expensive, further informaqtion can be found on our circle cutter page. CUTTING OIL. In order to protect your cutting wheel and prevent it from becoming dull quickly, cutting oils have been introduced. These oil are a little expensive, any light oil such as sewing machine oil will work just as well. You can put the oil either into the chamber of the cutter or keep some oil in a small container and dip the cutter into the oil as needed. Delphi Glass carry a large range of Pistol-grip Supercutters.